There's been a bit of a lack of baking round here lately so last night I decided to fix that by making the most delicious decadent cupcakes! 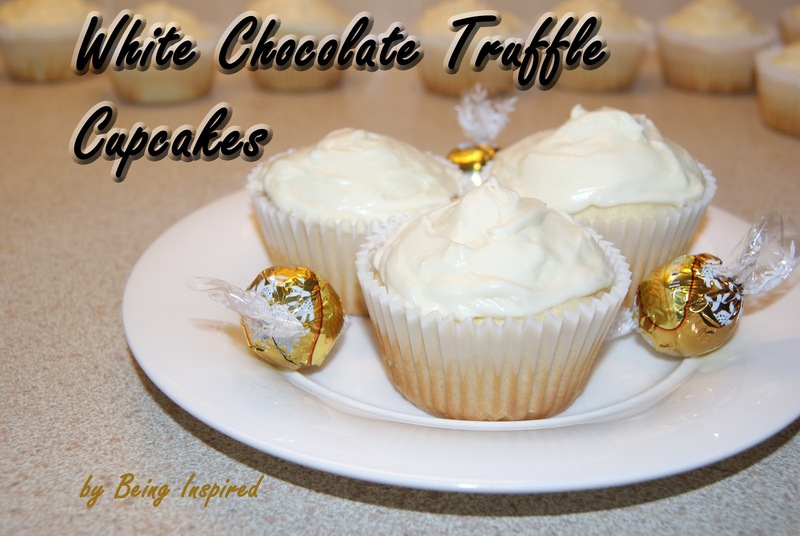 White Chocolate Truffle cupcakes - sound amazing right? :) I've adapted this from a recipe I found at The Pampered Chef. And even better - the truffles are hidden inside the cupcakes! And you all know how much I love hiding stuff in cupcakes! (Like these Brownies Cupcakes with strawberries hidden inside and Inside-Out Carrot Cake Muffins). Add flour and baking powder to a bowl and stir together. Combine milk and vanilla essence in a glass/small jug. Separate your egg whites from the yolks. Add egg whites to a bowl and beat until stiff peaks form. Beat butter and sugar together in a large mixing bowl until fluffy. Add flour mixture in three parts, alternating with milk mixture in two parts. (As in flour, milk, flour, milk, flour!) Beat until well combined. Fold in egg whites and stir until smooth. Divide the mixture evenly between the muffin cases. Bake for 17 - 20 minutes until lightly golden brown. Then place them on a wire rack to cool. Let the chocolate cool (pour ice cold water into the saucepan and place the bowl into it to speed this up). Then add cream cheese, butter and vanilla essence. Beat until well combined. 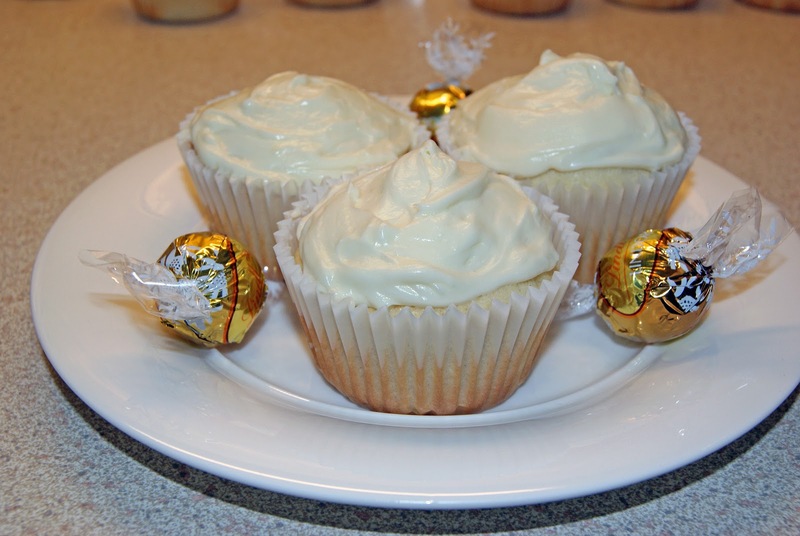 - The recipe says to put the truffles in as soon as you take the cupcakes out of the oven but I think I'd leave them a few minutes first in future. That way the truffle would melt but not completely like mine did. - I think I'd try milk or dark chocolate truffles next time too. Just to add some colour! - I love this website - Traditional Oven - for converting measures of ingredients. How cute is this little guy?! Wanna make one of your own? You could buy one but making it yourself is half the fun! Grab some socks! 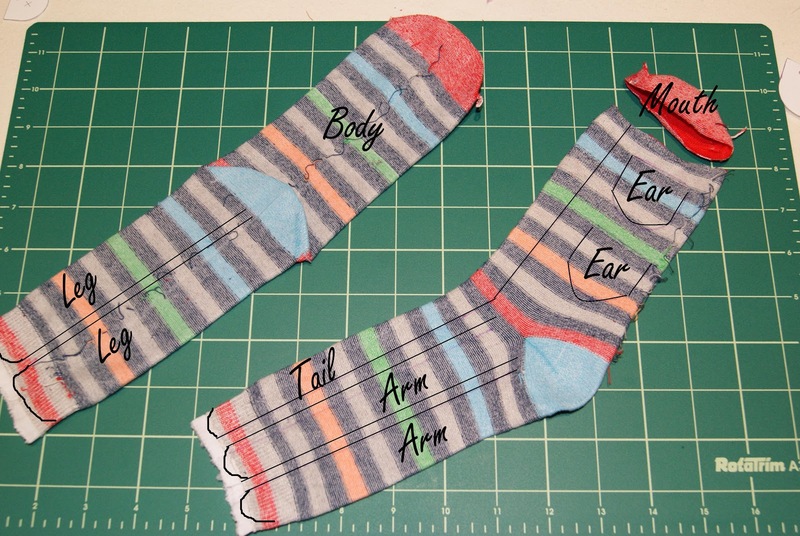 Stripey ones look very cute and make it easy to match up the sides when sewing. Here's the pieces all laid out. When you sew his legs make sure to leave a gap at the top so you can turn it and stuff his body and legs. Turn all the pieces bar the tail the right way out. Cut out a bit of white felt and pick some buttons for his eyes. Stuff his body and legs. Sew up the gap using a ladder stitch. Next sew his eyes onto the felt. Then sew the felt onto his little face. Stuff his arms and ears and sew the open end using a ladder stitch. 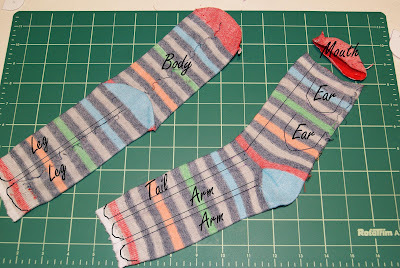 Fold the ears in half and sew the bottom to make them look rounded and pinched. Stuffing the tail is probably the trickiest part. For the normal sock one I just took a darning needle, threaded it and knotted the thread. Then I sewed a few stitches into a long piece of batting and fed the needle through the tail. Pull it out through the very tip and then gently pull the thread so it moves the batting all the way through the tail. For the fleecey one this just didn't work!! I think my batting may have been too wide or something but it kept breaking as I pulled it through! In the end I sewed a separate line of thread through the batting to make it more secure and then it worked okay. Then sew your tail in place. And sew on his arms and ears. Pin his mouth in place and sew 3/4 way around, stuff and then sew the rest. Use embroidery thread to sew on his mouth (use a backstitch). Then let your little guys rock out. 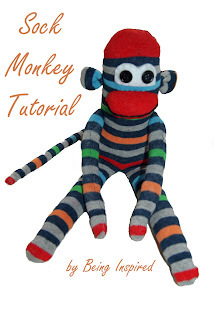 - Two sock monkeys are even cuter than one. I don't know about you but I love fridge magnets!! And luckily you can pick up magnetic paper in the €2 shop so you can print your own pretty easily. Here's two of my favourites. 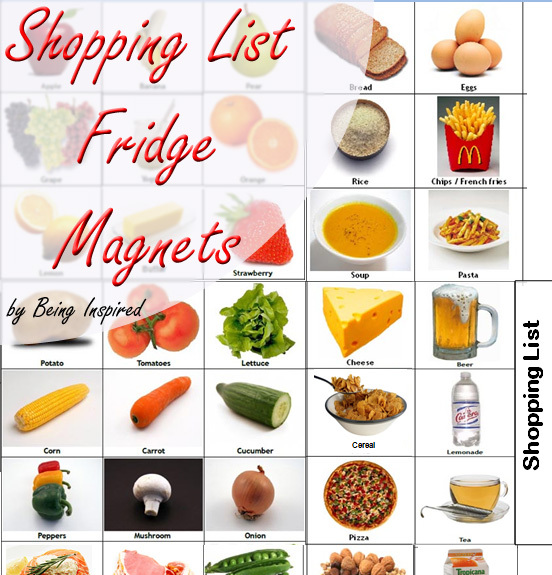 Shopping List Fridge Magnets! These are really easy to make. 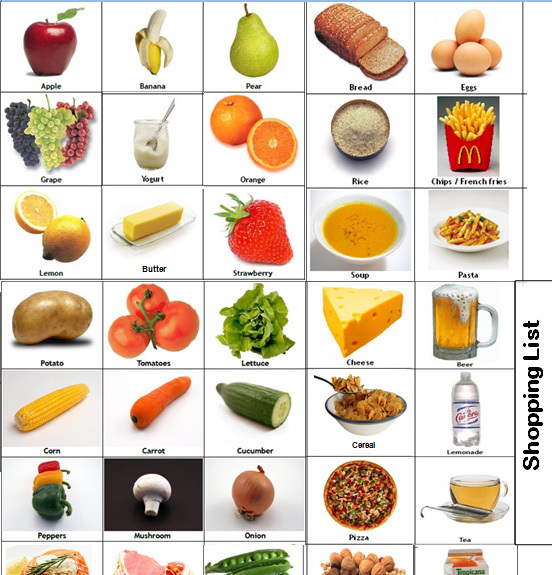 I've uploaded the template so just print onto magnetic paper, cut and stick on your fridge! 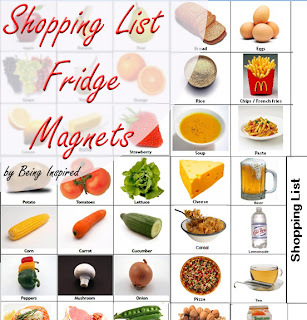 Then next time you go to get some tomatoes from your fridge and realise you've none left you can take your tomato magnet and place it under the shopping list magnet. Keep building your list as you run out of things/think of what you need. 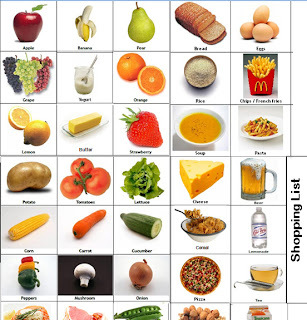 Then before you head out shopping you can just glance at your fridge and see what you need! Better yet take a quick picture of your list on your phone and then you can bring it with you without even writing it down. I've left it as an editable word document so you can change things like "rashers" to "bacon" in case you're not Irish! :) Unfortunately I don't have any pictures of these as I forgot to take one before I gave them to my sister but I think I'll have to make some for myself anyway! - Print this out on a piece of normal paper first to make sure it prints okay. I tried to use up as much space as possible and it prints fine on my printer but I don't want anyone ending up with the edges missing and wasting magnetic paper ! *Update - want to see what I ended up making for my next iPad cover? Click here for another tutorial! This was definitely a figure it out as you go along project so my measurements were quite rough and I changed my mind a lot but I'll do my best to make it into an easy to follow tutorial! Any questions just ask! First cut out your fabric, interfacing and batting. Here's the tricky bit. I cut all of mine 12 inches x 11 inches and then as I was making it it seemed huge so I ended up trimming it! I'd say 12 inches x 10.5 is probably better but just see how you get on. It's always easier to cut it smaller if its too big than the other way around! I also cut out a 5 inch squares of my lining fabric to make a pocket. I have three in the picture as I was originally going to use this for the fold over tab but used the outer fabric in the end (about a 4 inch square) - up to you which you like! Lets do the pocket first. Fold about half and inch up from the bottom and an inch down from the top and pin and press. Then sew along the other two (unfolded) sides. If your material has a wrong side then it should be seen in centre in the picture above and the wrong side in the one below. The mistake I made was not sewing on the velcro at this stage. I hadn't decided whether or not to use velcro (and to be honest I'm still half tempted to take it out) so I didn't add it til later. But if you are using velcro to close your cover then pin each piece to the top of one of the pieces of lining fabric and sew in place. Make sure they line up properly! Next pin your two pieces of lining fabric together with the right sides facing each other. Pin around the outside and sew. Make sure to leave the top open and also to leave a gap of about 4 inches at the bottom (where you can see the little piece of paper in the picture). 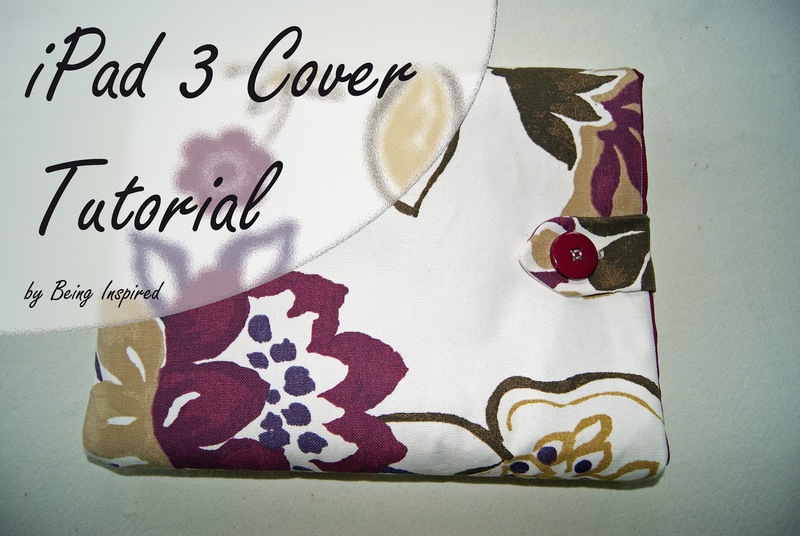 This is so you can turn your cover later on. I ended up sewing this again as the lining seemed too big. But just leave a pretty decent seam allowance and see what you think. It's easy to adjust. Next I ironed the fusible interfacing onto the wrong side of my outer fabric (forgot to take a picture!). Place it shiny side down and iron on a cotton setting. This will just make the cover a bit sturdier. Then I sewed the batting to the outer fabric/interfacing. This might not really be necessary but it just makes it easier to work with for the next step. Pin it in place on top of the interfacing and sew around the edge. I was afraid my sewing machine would protest against sewing the batting but it was fine. Just give it a quick clean after to get rid of any runaway fluff! Now you should have two pieces of your outer fabric with interfacing and batting sewn in place. Pin these two pieces together with the right sides facing each other. Sew around the two side and the bottom, make sure to leave the top open. Clip the corners and turn the right way out. At this stage I finally committed to velcro and sewed it in place. A bit trickier to do! I sewed around the edges and also one line through the middle of each piece of velcro to make sure it is good and secure. The button and tab are really just to look pretty as the velcro with keep it safe. But I like pretty. :) Sew your button in place, making sure its centered. For the tab cut a piece of the outer fabric about 4 inch x 4 inch. Mine's a bit longer but I ended up chopping an inch or two off! Fold it in half, right sides together and pin. Mark a triangle at the end to make your tip. Sew around the edges and across the marked lines. Leave the other end open. Then cut off the excess and turn and press. Mark a line about an inch long (depending on the size of your button) near the pointed end and sew a button hole. Carefully cut it and test to make sure it fits! Pin your tab pointed end down to the buttonless side of your cover. Test to see if it closes easily. Sew across the top to secure in place and trim off the excess. 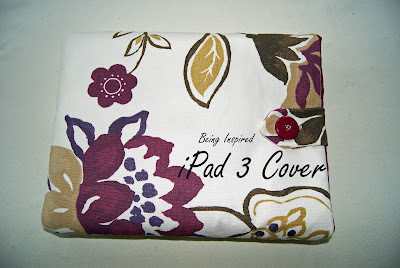 Slide the outer cover inside your lining. It should fit nice and snugly. If it seems too roomy then sew around the lining again to make it a bit smaller. The pocket should be facing the outside of your cover now. And you'll be able to see the batting inside like the picture above. Pin the lining and outer cover together. Now the fun part. Remember the 4 inch hole in your lining? Push the outer cover through the hole. 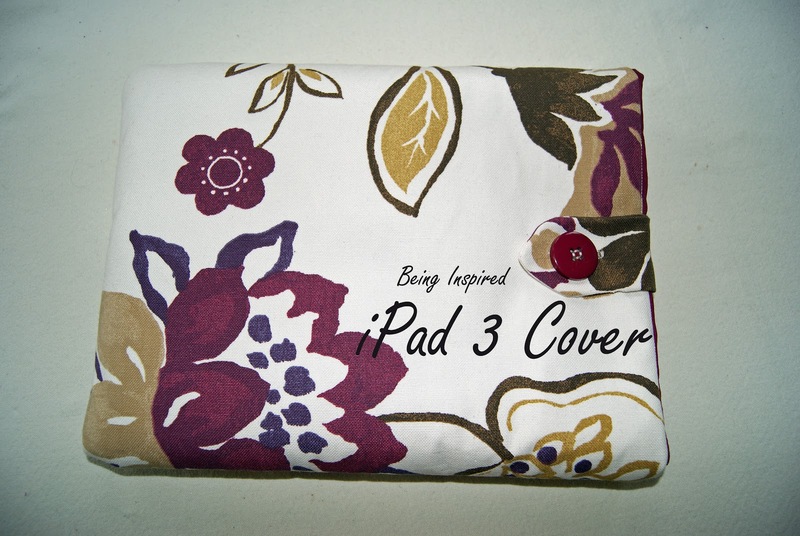 Now your cover should look like this! Push the lining inside the cover. - I'm still tempted to take out the velcro and just use the button to close it but I'll wait until I actually have the iPad and see. I definitely wish the velcro was a little further down inside the cover so you couldn't see it so easily. - I didn't trim the excess off the outside/batting fabric after I'd sewn it as I thought it would give a bit of added protection for the iPad at the sides and bottom but I kinda wish I had now as it's a tiny bit bulky. - I'd also probably use a slightly thinner batting next time. Although this does seem nice and cosy and protective! Day 19 - Balloon Parcels! Day 10 - Blogging tricks!